Yes, fellow believers, we have it all! 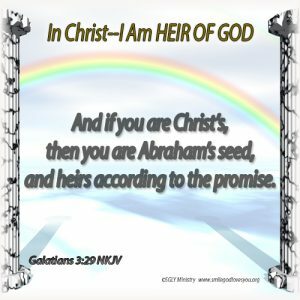 We are royalty, we are citizens of heaven, let’s begin to live like it, and claim the promises we have been given by God and all the spiritual blessings we have in Christ. Let’s rejoice that we are one of Abraham’s seed and that the Holy Spirit now dwells within us. We have been given so much, let’s begin to be fruitful daily and bring glory to the God who loves us and let’s share this news with others who may not know Christ, so they can be saved and blessed too!